September was pretty much busy, busy, busy around here. I made this baby bassinet for my baby who is turning two this month. She doesn't go anywhere without her best friends, her two stuffed Mouses, so I thought she could use something stylish and sweet to carry them in. I used my friend Elizabeth's Baby Doll Bassinet tutorial over at Twelve Crafts Till Christmas. 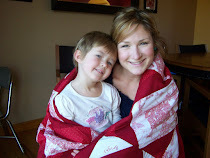 Actually, when I made mine, I used pre-quilted, double-sided fabric instead, and followed her pattern just starting at the "outside". Anyway, it was super fast and easy to sew--even quicker because I skipped making the lining. I plan on adding a personalized tag with my daughter's name on it and the date before I give it to her. I also plan on making another one for my other daughter using the same fabric...but I'll make it with the blue side out this time! Anyway, if you can sew even a little bit and you have a little girl, you should totally make this for a birthday or Christmas gift. Elizabeth actually has tutorials for making a matching diaper bag and even cute little "wipes". It's adorable...Check it out! And remember to enter to win this week's giveaway of the book "Jesus Calling" here. Oh my goodness, that is so cute. Too bad I can't sew at all, and I have all boys. But if I had girls, I would learn to so just so I could make one! I can't sew a stitch, but that is the cutest thing ever. how fun, too bad my grand daughters are past the age of dolls-in Jr. High now! Time moves quickly. Very cute! I like the choice of fun colors. I've been thinking and thinking about those tutorials of hers. I think I may try to do one of those as well. How cute!! I bet your daughter is going to LOVE it! That is just the thing I need! Thanks for posting. We are going with homemade gifts for Christmas this year and this will be for my 16 month sweetie who loves babies. ooh..she's a lucky one to have that to tuck her babies in! !